Audioengine is no stranger to manufacturing high-quality loudspeakers capable of producing clear sounds and good beats that are music to anyone’s ears (you see what we did there?). The P4 bookshelf speakers are on the cheap side of the company’s product spectrum, and from what we’ve seen, that doesn’t make them any less capable. Of course, you’ll have to sacrifice a thing or two when going with a product in the sub-200 price range, but the overall experience is quite satisfying. The AP4 speakers come in three different finishes to meet the tastes (and room décors) of different audiophiles, something that’s hard to find in audio devices within this price range. The P4 bookshelf speaker from Audioengine measures 5.5 inches tall by 6.5 inches wide by 9 inches deep, making them true compact devices capable of fitting nicely on any shelf. The cabinet is made of MDF, with a rubberized plastic outer texture that hides fingerprints to preserve a sharp look all the time. The woofer, driver, and tweeter look equally appealing, which adds to the overall beauty of these speakers. To sum it up, when it comes to the design and measurements, the AP4 speakers do excel, but how do they perform in terms of sound quality? The P4 bookshelf speakers, despite their size and price, excel when it comes to music delivering, especially vocals, as they offer a crisp sound with plenty of detail without being too loud. The drivers provide exceptional clarity and excellent resolution. Overall, the speakers can feel as if you were listening to a large powered amplifier system. You may feel that the sound is fractionally bright sometimes, but that doesn’t stop these devices from offering some of the best beats on high frequencies. To be totally fair, it’s pretty hard to find compact budget speakers capable of producing captivating bass, and the same goes for the AP4 bookshelf speakers. Although they’re excellent when it comes to vocals and clarity, they’re not as impressive when trying low frequencies. Because of their size, these speakers seem lacking when it comes to the depth with a lack of detail and eloquence every now and then. Mind you, the sound isn’t muddy by any mean, but the lower you go, the worse the articulation of the mix. The midrange communication of the AP4 speakers is what you’d expect from audio devices in this price range, with a smooth transition from the tweeter to the driver. In this department, the AP4 bookshelf speakers get our thumbs up thanks to its sweetly articulate midrange. Due to how well they handle vocals, the P4 bookshelf speakers are an excellent companion for any home theater, either on their own or as part of a whole system. We can confidently say that the P4 are among the best and clearest budget bookshelf speakers you can get whether you’re trying to enjoy Blu-ray movies with the fellas or listen to vinyl records whole enjoying the detail of the musical masterpieces. Audioengine cares about the packaging as much as they care about the aesthetics and visual aspect of the actual speakers. The AP4 speakers are delivered in synthetic velvet bags with drawstrings. Overkill much? Maybe, but it’s definitely a nice touch if you’re getting these speakers as a gift for an audiophile relative or friend. The Audioengine P4 bookshelf speakers are cheap audio devices, there’s no denying that, which explains why they come with a few compromises. 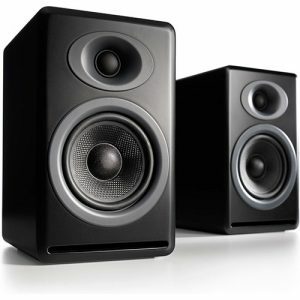 Nevertheless, the price, dimensions, and materials of these speakers make them worth a shot, especially considering the sound quality they offer. At time of review, the Audioengine P4 featured in our “Best Bookshelf Speakers Under $200” category. Please check above for latest price and user reviews.